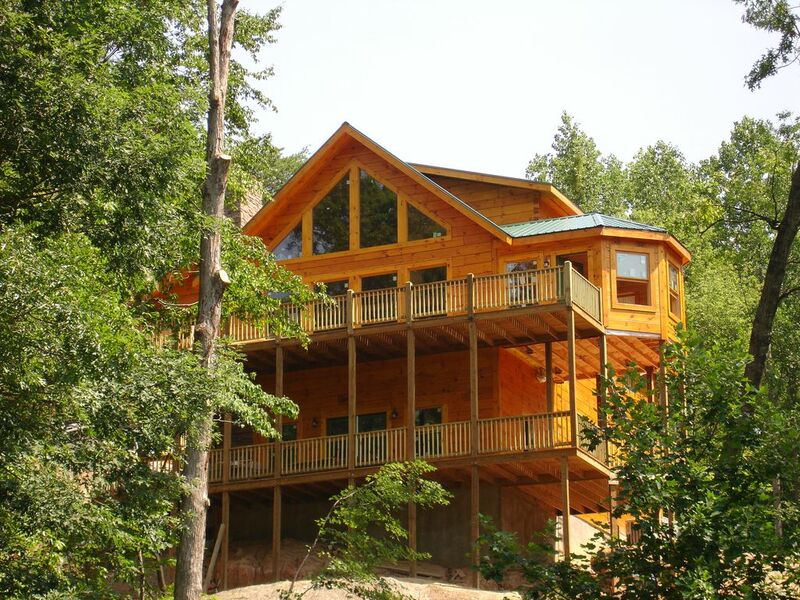 This log home is located within the Rumbling Bald Resort. New decks 2016. Commercial grade outdoor propane fire pit controlled by light switch (out of reach of small children). Not all homes are in Resort behind the gates and not all homes have INTERNET. This one does. Some homes have access to Resort but it is a pain to drive to the amenities. Make sure you know what you are renting and where it is located. Dancing Falls Lodge - Overlooks SCENE LOCATION from DIRTY DANCING movie- 5 Star home. Located within the gates of the Rumbling Bald Resort. Note only houses located in the resort have access to the resort amenities (2 golf courses, 3 outdoor pools, 1 in-door pool, private beach and marina (boat rentals available), tennis courts, putt putt, fitness center, spa, etc). Situated on the golf course and overlooks the 16th hole (a scene location from the movie Dirty Dancing), a beautiful pond and waterfall. You can hear the soothing sounds of the waterfalls when you sit on the deck. Spectacular view of Bald Mountain from the covered front porch. We have free WI-FI. Note some homes do not have access to the Internet. We also provide unlimited long distance (US only) as cell phone coverage is spotty in the mountains. We also have a cell phone booster. NO MOTORCYCLES (Resort rule). You can park them at Resort parking lot though. We offer a 6 seater, gas golf cart for $65 a day or $395 for the week. We also rent a 4 seater, electric cart for $45 a day or $270 a week. If one is rented, it must be rented for the duration of your stay. These carts are also offered to two other homes we manage. First come, first served. A separate invoice will be sent. Resort amenities like use of swimming pools (indoor and outdoor), sauna and steam room are free for our guests. We manage 3 other homes: www.VRBO.com/748395. It is conveniently located right around the corner on the same street from this property. Check in is at 4 PM unless it is already cleaned and no one is in there the night before. Check out is 10 AM unless no one is coming in after you and it doesn't need to be cleaned that day. Watch the online calendar and check in with me a few days before your arrival. No early check ins or late checkouts are permitted in the summer as we have back to back rentals and we need all the time to clean it and do any maintenance. We want it to be perfect for your stay. Overlooks waterfalls: Year Purchased: 2008 - Spectacular views, resort amenities and close to Biltmore and Chimney Rock. Lots of shopping in Hendersonville. Owner Description/Comments: We moved from Brecksville, Ohio to Charlotte, NC in 2006. We looked for two years for the perfect vacation rental home. We were looking for a place that was close to Charlotte, had a beautiful view and was located in a resort so there would be lots of things to do. We love Lake Lure so much we have now made it our primary residence (a mile away from this cabin). This allows us to keep the cabin in top order at all times. We moved from Brecksville, Ohio to Charlotte, NC in 2006. We looked for two years for the perfect vacation rental home. We were looking for a place that was close to Charlotte, had a beautiful view and was located in a resort so there would be lots of things to do. We love this area so much we moved to the same Resort a mile away from this home. Since we live here we can make sure the home is well maintained. If our guests need anything, we are close by. We found the perfect place when we bought Dancing Falls Lodge as it overlooks one of the scene locations from the movie Dirty Dancing. Spectacular views and a full service resort. The lodge that has it all. Scene location of Dirty Dancing. Golf cart available. View of waterfalls. Inside the gates of the Rumbling Bald Resort. On golf course. Views of Rumbling Bald Resort. Log Home. Owner Operated (we live a mile away) so the property is maintained and well kept. Level One: Master bath has walk-in shower and separate tub. Additional half bath. Level Two: Full bathroom with tub and shower. Lower Level: Full bathroom has walk in shower. Situated BEHIND the gates of the Rumbling Bald Resort. Some homes have access to Resort, but aren’t behind the gates. Unlimited long distance (US only) Cell phone coverage is spotty in the mountains, but we are one of the few homes that has a cell phone booster. All linens are provided. Please strip beds at checkout. Garage is available to guests and houses garbage cans and golf cart. Free WI-fi. WiFi extenders throughout house. 16 sets of towels provided. Please bring your own beach towels for pools. Full fitness center located at Resort. Free access. Kitchen -2 Stainless steel refrigerators in the kitchen and a 3rd refrigerator in the garage. Fully stocked kitchen with all major kitchen appliances - pancake griddle, crock pot, waffle maker, coffee pot (2), Kuerig, food processor and more. Extensive library of DVDs. Please mark videos that you bring so you don't take ours home by accident. One bedroom has doors that open with unbelievable views of Bald Mountain. Bedroom overlooks family room and fireplace. Rent at Resort. They have kayaks and paddle boards for rent. Can rent pontoon boat from Resort marina or you can rent high speed, high end wake board ski boat from Adventure boating. Includes private driver. Bring your own cooler. Two wrap around decks. Spectacular views of bald mountain. Log cabin deck furniture. Included when rent boat from Adventure Boating. We provide a few inner tubes for lazy river. Bring additional if needed. Rumbling Bald indoor and outdoor pools. See Rumblingbald.com for more details. Minimum Age (30) Limit for Renters. Plenty of activities for children of all ages. Playground close by. Level One: great room with vaulted ceiling and wood burning fireplace and large flat screen TV. Fully loaded kitchen with granite counter tops, stainless steel appliances, large dining room and a four season sun room with access to a large deck. Lower Level: Walkout screened in porch and a large deck with hot tub. Large family room with pool table, Foosball table and big screen TV. A laundry room with washer and dryer. Three refrigerators.. Extras: TVs with cable and DVD player in all bedrooms. Stereo/CD player. Wireless Internet. Fabulous Family and Friends vacation spot! We came to Lake Lure it was our first time, for our son's wedding, and after much research chose to stay at the Dancing Falls Lodge and we were thrilled!! The home was clean, inviting and had all the amenities they advertised and the view was absolutely beautiful! We had friends as well as family stay with us and others nearby, everyone wanted to come to our house! We are planning our next friend and family vacation and everyone wants to stay at the Dancing Falls Lodge! Thank you so much for a wonderful experience!! Thank you for the stupendous review. So happy to hear you are coming back again. This was a great house for all ages. It was very clean. It has lots of games and movies. We all played pool. The decks are huge. The location of the house was very close to Chimney Rock. There are three refrigerators. We are entirely pleased with our selection and would recommend this house without reservation. The owner was more than helpful. Thank you! Aww, thank you for the awesome review. Please come back again. We really enjoyed our stay at “Dancing Falls Lodge”. Thank you for the wonderful review. Thank you for leaving our home in such great condition. Please come back again. From the beginning of the booking to the moment of checkout, the entire experience was perfect! We originally got snowed out of our cabin weekend (beginning of Dec. 2018). Although it was terribly disappointing, Laurie graciously worked with us to reschedule for a weekend that worked with our busy schedules. In the end, we truly had “the time of our lives”! This cabin has all the charm that the pictures/videos show and more. Every little detail has been attended to. The open kitchen and large dining table makes for heart-warming personal exchanges while hanging out. The multiple fridges proved to be one of the most valued amenities. We enjoyed the pool table, foosball table and hot tub. Although it rained every minute while we were there, we still enjoyed ourselves! We would have loved to have enjoyed the fire pit, but the cabin offered plenty of opportunities inside. In addition, the area offers all kinds of fun! We went to a brewery Saturday afternoon in the village, and visited the shops. This area is spectacular! The resort has so many amenities that we weren’t able to get to in 2-1/2 days. We are, normally, beach people, but this cabin made us want to cancel our summer beach plans, and come back here. It was magical, and we will be back!!! Thank you for the amazing review. Cancel your summer beach vacation and come back. We still have several weeks open. This home was absolutely perfect for our multi-family vacation! So much space to all hang out together or separate. Could not have been happier! We thoroughly enjoyed our stay at dancing falls. The home was beautiful and spacious enough for our large group. The location is perfect and convenient to so many activities and adventures in the area. We had many laughs and made lots of fun memories with our families! Thank you for the great review and so glad to hear you made lots of fun memories. Please come back. Lake Lure, Blue Ridge Mountains, North Carolina, USA (Asheville, NC. is 25 miles. Chimney Rock 15 minutes.) - The Mountain Kids Club provides an adventurous and educational recreation program for youth ages 7 to 13. This structured and well-supervised program provides introductory experiences for a variety of outdoor recreational activities including: hiking, horseback riding, kayaking, canoeing, speed tubing, fishing, gem mining, and more. Each week the Resort Shuttle takes small groups of guests directly to our area's most beautiful attractions. When we take care of the driving, you can focus on having fun! Adventure outings are led by knowledgeable staff members and include stops at some terrific dining spots for lunch with plenty of personal time. Golf: Two golf courses - Bald Mountain and Apple Valley. If you want a quote, go to the section Book it (upper right hand corner). There you can either get a quote or book it. The dates available will display on the calendar. Calendar is always up to date. Any damages will be covered by the insurance policy of $59 (not refundable). We offer a 6 passenger, gas golf cart for rent at $65 per day for the duration of your stay or $395 for the week. We do not rent it for just a day. If you have a 3 night stay, the fee is $195. Please contact me to reserve it as it is occasionally rented to other homes. First come first served. Once you have confirmed, I will add it to your reservation and you will receive an additional invoice for the cart(s). We rent the carts to two other homes so First Come, First Served. Homeaway/VRBO started charging a service fee in Feb 2016. This is not a fee that comes to me, nor is there anything I can do about the fee. You can go to Help and type in Service fee to learn more about The refundable $100 fee is to ensure guests follow the departure checklist and leave the home in good order. It will be refunded within a week after departure. If you make an excessive mess, it is not covered by your cleaning fee. This property has a Private Caretaker. Please read Traveler reviews. 100% refund if cancel more than 30 days.